When Bob Kent went on a helicopter flight over the Bungle Bungles in WA’s Kimberley region, he was so impressed that he arrived back home in Esperance and ordered his own helicopter. Now, on the brand new Robinson 44 Clipper II helicopter they purchased late last year, Bob and wife Julie take eager visitors on a truly unique over-water aerial adventure. The new helicopter flies over the Recherche Archipelago and up to 100km offshore. The Archipelago is the largest group of islands in southern Australia and consists of 110 islands and 1500 islets spread over 270km of coastline. Fast gaining recognition as one of Australia’s most important aquatic wilderness areas, what better way to this stunning coastline from the air on a tour with Esperance Helitours? Flights operate daily from the James Street groyne, located on the Esperance foreshore (The Esplanade) between October and April. During the remainder of the year flights are operated from Bob’s own property by appointment only. 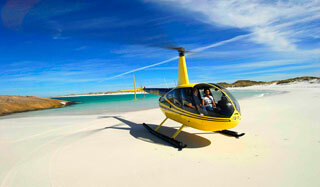 A range of holiday packages to Esperance are available with Skywest Airlines or Transwa. More info at www.australiasgoldenoutback.com or on 1800 812 808.